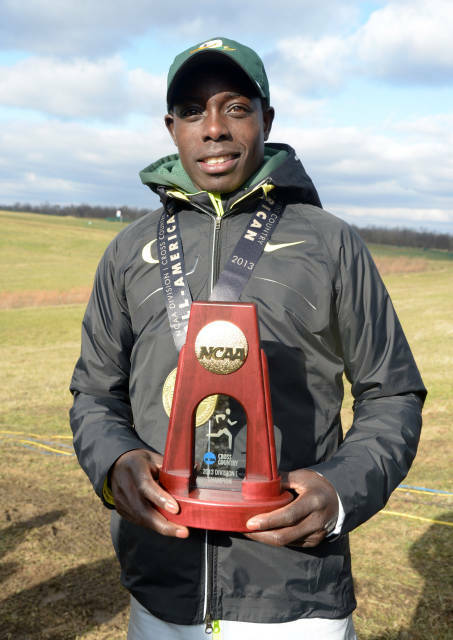 Two-time NCAA cross country champion Edward Cheserek was named the 2014 U.S. Track and Field and Cross Country Coaches’ Association Division I Men’s Scholar-Athlete of the Year on Wednesday, pacing a group of six UO Ducks to earn national academic honors. Cheserek, a sophomore, maintains a 3.30 GPA while majoring in business administration and is the second Oregon student-athlete to earn the award since Galen Rupp was honored in back-to-back years in 2007-08. Joining Cheserek is Tanguy Pepiot, who was named to the men’s all-academic team. The track and field all-American holds a 3.85 GPA while majoring in general social science. From the women’s team, Alli Cash (3.91 GPA in human physiology), Annie Leblanc (3.68 GPA in human physiology), Megan Patrignelli (3.60 GPA in human physiology) and Molly Grabill (3.48 GPA in sociology) each made the all-academic team. The total of six student-athletes earning academic honors is the most in UO history, beating the previous record of five in 2007. Beyond the individual honors, both the Oregon men’s and women’s cross country teams earned academic team awards, surpassing the 3.0 GPA mark, with the women at 3.35 and the men at 3.06. To see the full list of USTFCCCA academic honors, click here.